Eight US soldiers have been killed in bomb attacks in southern Afghanistan, say Nato-led forces. An Afghan civilian was also killed in what were called "multiple complex IED attacks" - or improvised bombs. 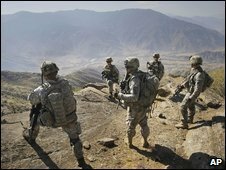 The deaths make October the deadliest month for American forces in the eight-year war in Afghanistan. On Monday, 11 soldiers were among 14 Americans killed in multiple air crashes. In total, 55 US troops have died in October, the Pentagon says. The news of eight more casualties in Afghanistan comes at a time when President Obama is pondering what to do next in Afghanistan. Americans are still waiting to hear whether the president is planning to increase troop levels. And this incident will contribute to the perception that the situation there is deteriorating, not improving. The use of improvised explosive devices in these attacks seems to be part of a trend towards fewer conventional direct-fire engagements and more guerrilla-style attacks. It looks like these tactics are migrating from Iraq to Afghanistan, where we are seeing the Taliban increasingly using roadside bombs to attack coalition forces. Like many deaths in Afghanistan, Tuesday's bloodshed was blamed on the improvised explosive devices (IEDs) that pose the biggest threat to foreign forces operating in the country. "Additionally, several service members were wounded in these incidents and were transported to a regional medical facility for treatment," said a statement from the International Security Assistance Force (Isaf). Military spokesmen said there had been two attacks on patrolling vehicles in the volatile south of the country - one which killed seven soldiers and the Afghan civilian, and a second attack that killed one soldier. But few other details were given, pending the notification of the soldiers' next-of-kin. Also on Tuesday, the remains of three US crew were recovered from a US reconnaissance plane that disappeared on 13 October in Nuristan province in mountainous north-eastern Afghanistan. Nato said the incident remained under investigation, but hostile action was not believed to be the cause of the crash. On Tuesday, the Washington Post newspaper reported that a senior US diplomat in Afghanistan had resigned, saying he had "lost understanding of and confidence in the strategic purposes of the United States' presence in Afghanistan". State department employee Matthew Hoh, who was posted to Zabul province, said that the insurgency in some parts of Afghanistan arrived only after the US troops did. US President Barack Obama is currently undertaking a review of American strategy in Afghanistan. He is under pressure to reinforce the US military presence by tens of thousands of US troops - but many Americans are likely to oppose such a course in light of October's succession of deadly incidents, says the BBC's Andrew North in Afghanistan. Mr Obama vowed on Monday that he would not rush the "solemn decision" to send more troops into battle, amid accusations by critics that he is dithering. Tuesday's attacks also come amid heightened tension in Afghanistan in the run-up to the second round of a presidential election marred by widespread fraud in favour of incumbent President Hamid Karzai.